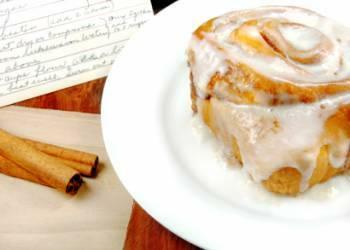 Choosing the best cinnamon roll recipe has a lot to do with what you're looking for. Of course you want them to taste great, but what else do you need? The healthiest ingredients? The fastest prep and cook times? Would you just like it if they're as ooey, gooey, and impressive as can be, with no concerns about a diet? Maybe the best cinnamon roll recipe is just a classic that saves you money and time because you don't have to drive to the mall to buy one. The recipe poster claims that this is a clone of the famous Cinnabon and that it can save you money if you make it at home instead of hitting up the Cinnabon store at your local mall. This recipe has earned a five-star rating overall at AllRecipes.com. While the recipe calls for a bread machine to make the dough, some reviewers state that they've been able to make these cinnamon rolls without one, and they still taste delicious. With 4.5 stars overall on AllRecipes.com, this cinnamon roll recipe that uses white cake mix is one of the best. The recipe author states that she makes them the night before and then lets them rise the next morning, saving a little bit of time. If you like pecans, you may especially love this recipe. Alton Brown's recipe at Food Network is another winner. It calls for lots of brown sugar and a cream cheese icing. This recipe has a five-star rating. The only downside is that you can't just pop them in the oven on a whim; they have to be stored overnight before you cook them. Don't let the name of the recipe deter you. These aren't in the traditional roll shape, but if it's an ooey, gooey treat you're looking for, this might be exactly what you want. It's quick and easy because it uses pre-made biscuit dough. The "rolls" pull apart effortlessly and the author suggests that you use six small Bundt pans instead of one big one so that they're even gooier. If you're a fan of cream cheese icing, you may be disappointed with this one because it uses a butter-sugar-cinnamon mixture, but the reviews leave this recipe's score at five stars. This recipe is another well-loved one on AllRecipes.com, and the author states that it's not as heavy as other cinnamon roll recipes. Please keep in mind that you'll need to wait an hour for the dough to rise, but the prep and cook times are short. This offering at Cooks Recipes claims to be the best cinnamon roll recipe. It is a traditional style cinnamon roll recipe with classic homemade cream cheese icing, plenty of cinnamon, and loads of sugar.